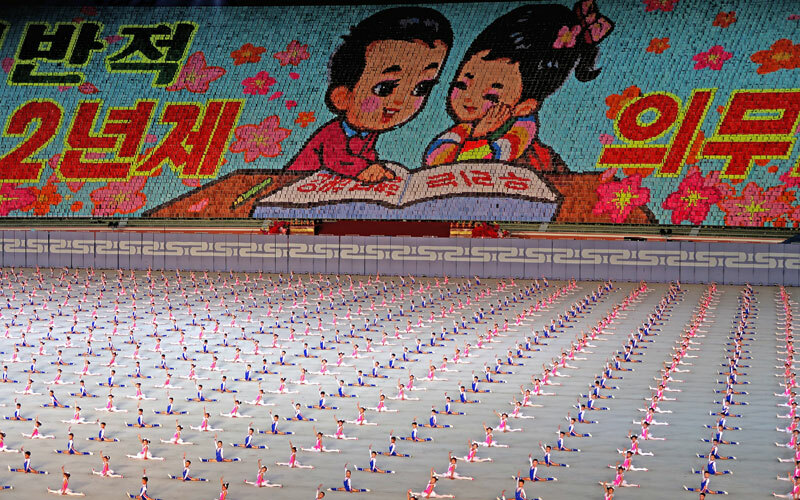 This year North Korea will be celebrating one of DPRK’s biggest holiday of the year for their Independence Day! 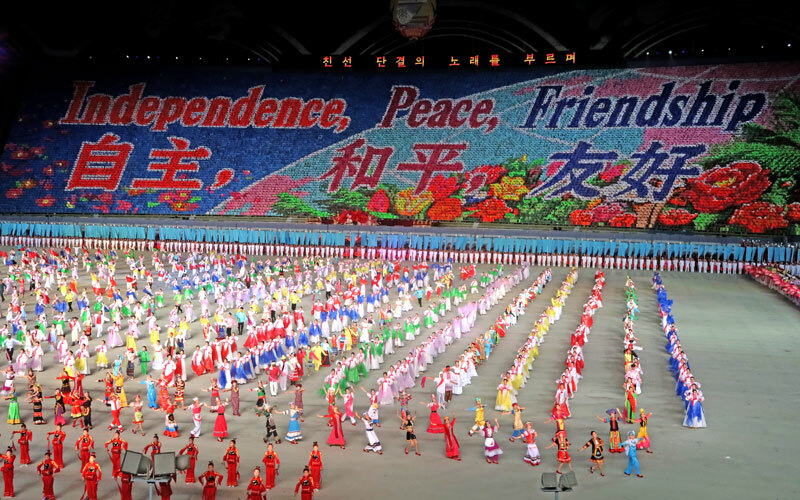 We’re expecting this celebration to be quite huge with thousands of locals partaking in the mass dance performance and with fireworks planned later in the evening. 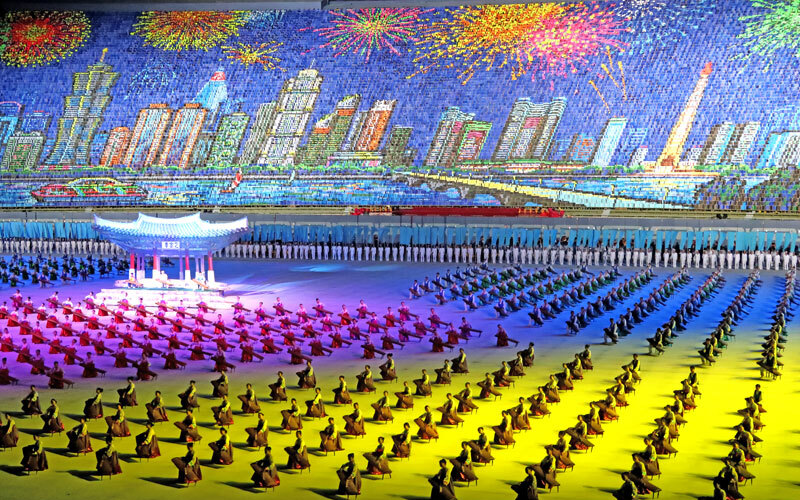 During our tour in Pyongyang we’ll be visiting the Kim Il Sung Square, stopping by a local fun fair, exploring the deep Pyongyang Metro, visiting the Mausoleum where Kim Il Sung and Kim Jong Il lay in state, checking out the Korean War Museum, and much more! 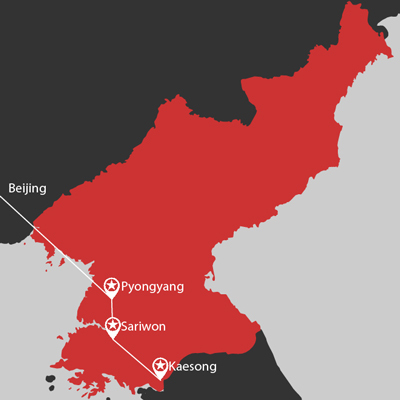 What makes this tour different from the others is we’ll spend an evening down at Kaesong city at a Traditional Korean Folklore hotel, only 8km from the DMZ! 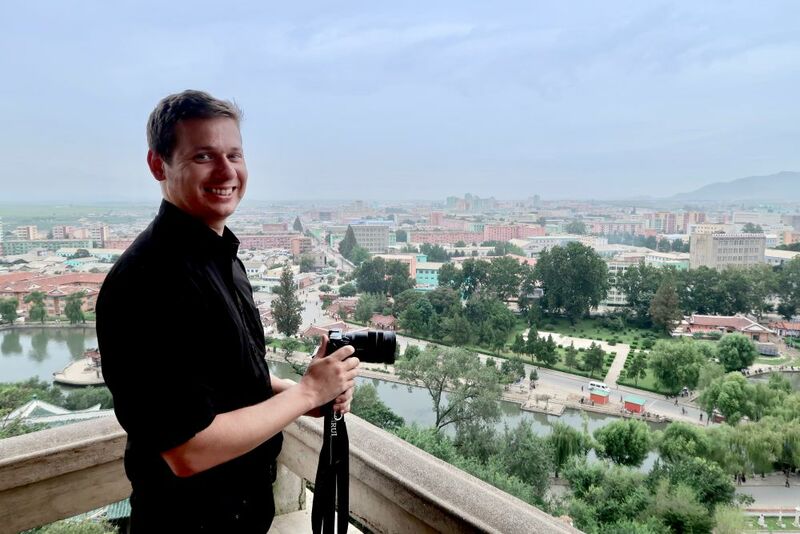 During your tour, we’ve been given special access to a Russian Mil Mi-17 helicopter to take for a whirl around Pyongyang city for a unique aerial tour of the capital. 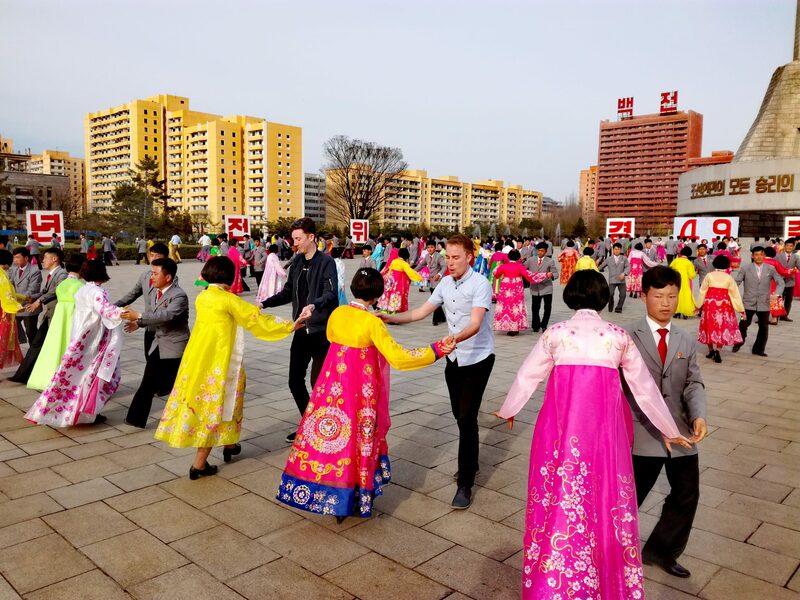 We’ll swoop around the iconic, 105-story Ryugyong Hotel, do a low flyby of the Taedong River passing the Juche Tower, have a great glimpse of May Day Stadium – the world’s largest stadium, and explore the many districts sprawling across the city for fantastic and unique photography opportunities. This joyride is completely optional and is €250 per person on top of the tour costs. If you are interested please let us know while booking. 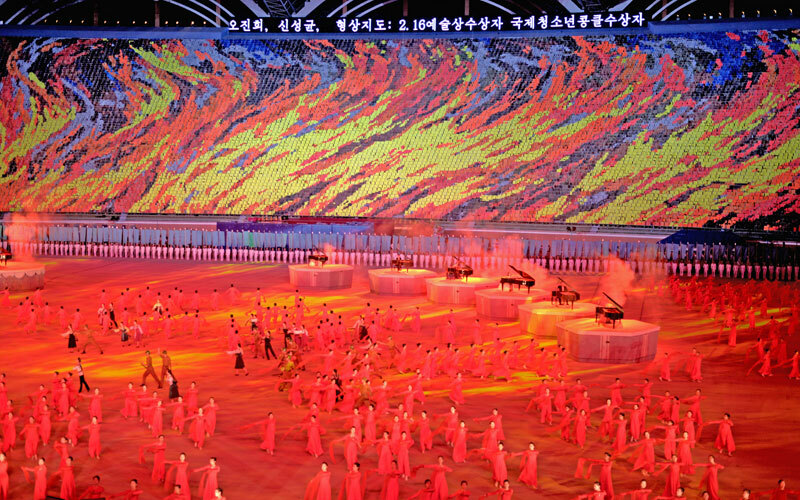 The Mass Games, the world’s largest performance with over 100,000 performers is expected to make a return this year! Now is your chance to watch this incredible performance! 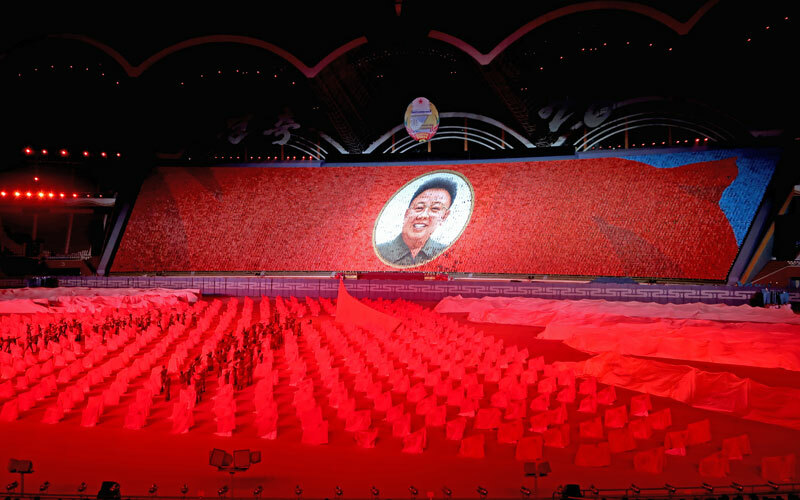 Ticket prices are on-top of tour cost and are available to be purchased and reserved in Pyongyang. Ticket prices will be announced closer to the event. We highly recommend securing your spot on tour early as we expect spaces to fill up very quickly. Before the tour why not join us for a full-on exploration of one of China’s largest ghost cities Ordos. Click here for more info. Train takers depart Beijing Central station at 5:25pm for the 24 hour sleeper ride to Pyongyang. Train group arrive at Dandong at 7:00am for Chinese border control then depart for Sinuiju at 10:00am for the extensive border control from the DPRK side. Flight takers depart Beijing Airport Terminal 2 on Air Koryo at 12:00pm (meet group at Air Koryo check in counter). Flight group arrive in Pyongyang at 3:00pm to a warm welcome from your Korean guides. Check in and overnight at the Sosan Hotel. Visit Mansudae Grand Monument – the two large bronze statues of President Kim Il Sung and Leader Kim Jong Il overlooking the city. (Optional extra- you can present flowers if you wish: small bunches are 2 euro, larger ones 4). We expect it to be very busy at this time with locals paying their respect. Lunch at the Chongryu Korean Hot Pot restaurant. 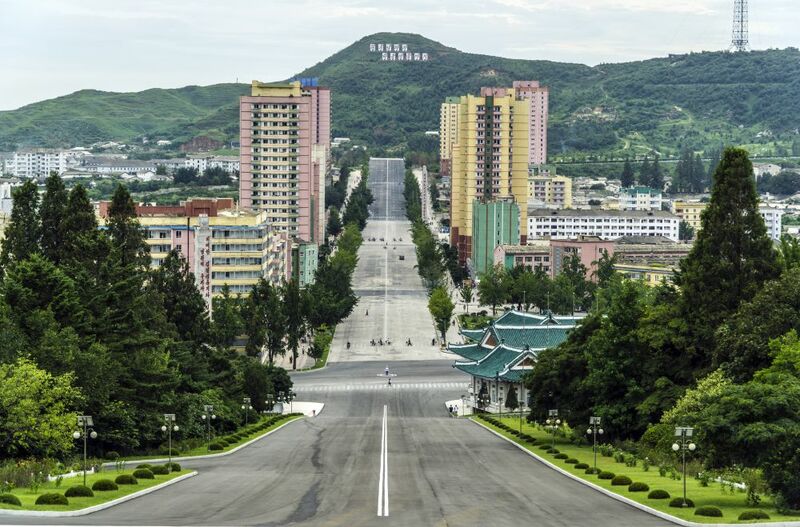 Kim Il Sung Square- The central square of Pyongyang City. Monument to the Party Foundation- Built in 1995 to celebrate the 50th anniversary of the founding of the worker’s party. Visit Kwangbok department store – here we can buy locally made items and exchange our foreign currency into local DPRK Won! Drinks at the Taedongang #3 brewery with seven different beers on tap! (Beers 1.5 euro each). Dinner at the Pyongyang Duck BBQ Restaurant. Kumsusan Palace of the Sun – The mausoleum for the Great Leader President Kim Il Sung and the Dear Leader Kim Jong Il. Grand People’s study House- Library and academic centre for adult learners, this grand building is built in the Korean style and affords a great view over the central Square. On the way stopping at Sariwon City (Capital of North Hwanghae province) to walk in the local folkcustom park and view the city from the mountain top pagoda. Monday 9th September – National Day! 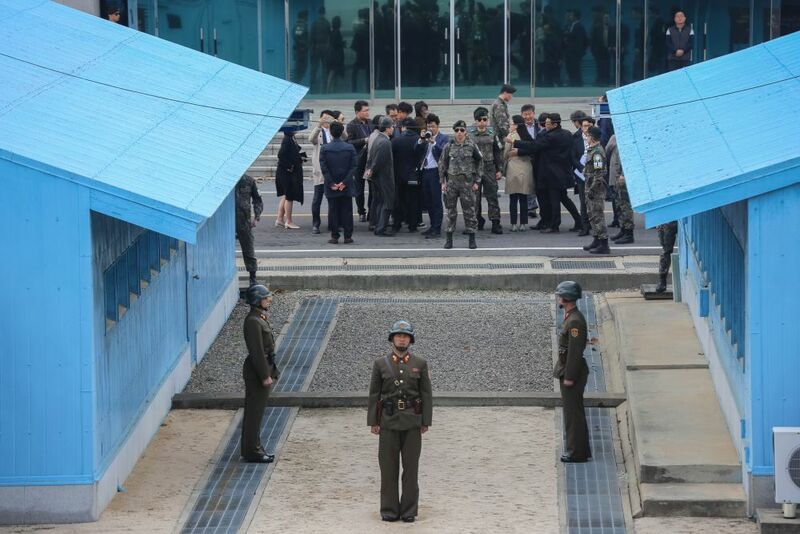 The DMZ – See one of the tensest places on earth complete with a friendly KPA officer who will not only give you a guided tour but also keep you safe. Also the only place you can take photographs of and even with a soldier! Special celebratory events (optional: approx 20 euros) – Yet to be confirmed but we will take part in any events that are possible for tourists to attend. These may include a circus performance, red orchestra, or possibly some other surprises. 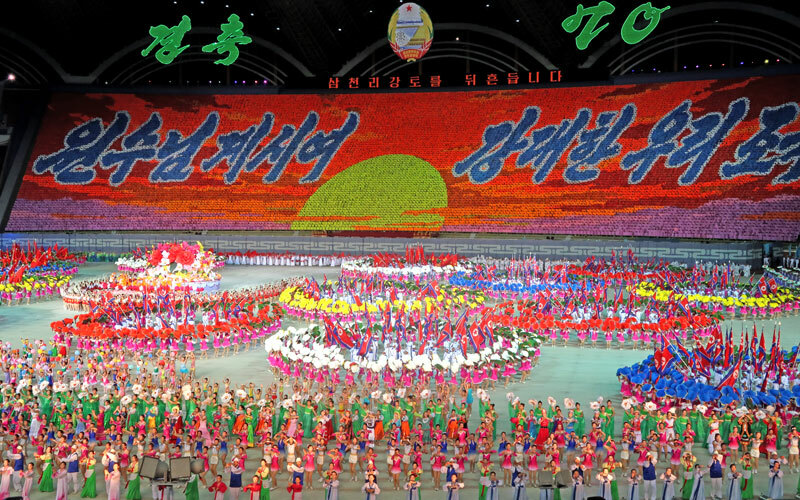 To be confirmed: We’ll gather in Kim Il Sung Square to watch the fireworks amongst the locals to celebrate today’s event. Visit Kaeson Funfair – entry 2 euros and ride are 3 – 5 euros. Train members depart at 10:25am for Beijing. Train members arrive at Beijing Railway Station at 9:00am. Mass Games return for 2019! 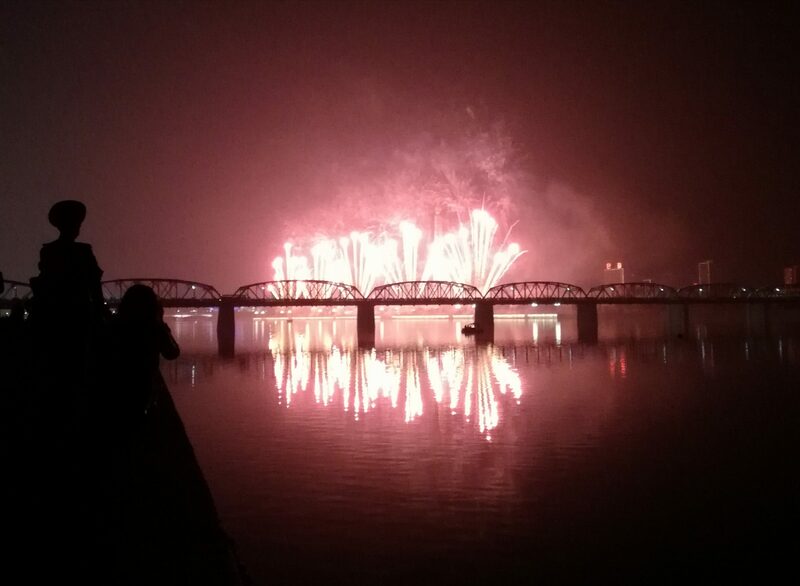 Spend a evening in Kaesong City, located only 8km away from the DMZ. 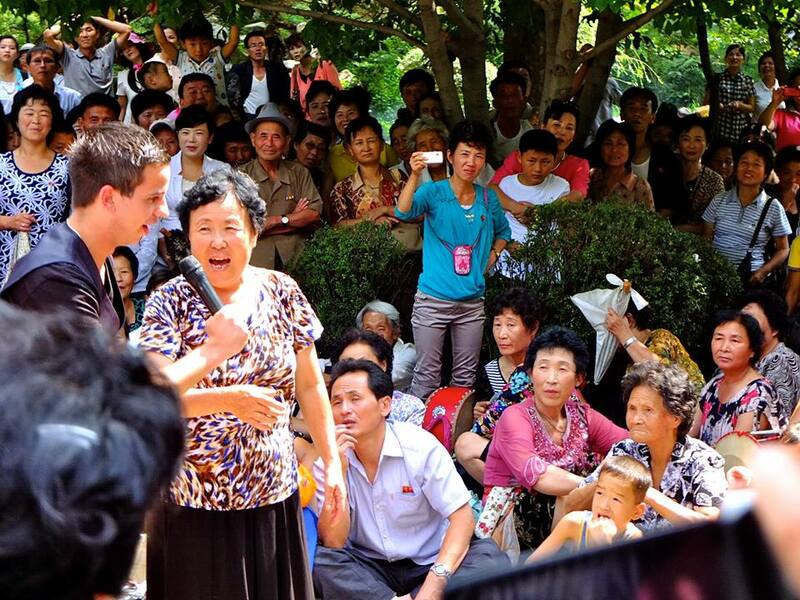 Explore Sariwon City, the deep & mysterious Pyongyang Metro, War Museum, and much more.